Sterling, CO, Dec. 26, 2018 –Logan County U.S. Department of Agriculture (USDA) Farm Service Agency (FSA) announced that Mike Brownell of Fleming, Colorado was elected to represent his local administrative area (LAA) during the recent county committee election. 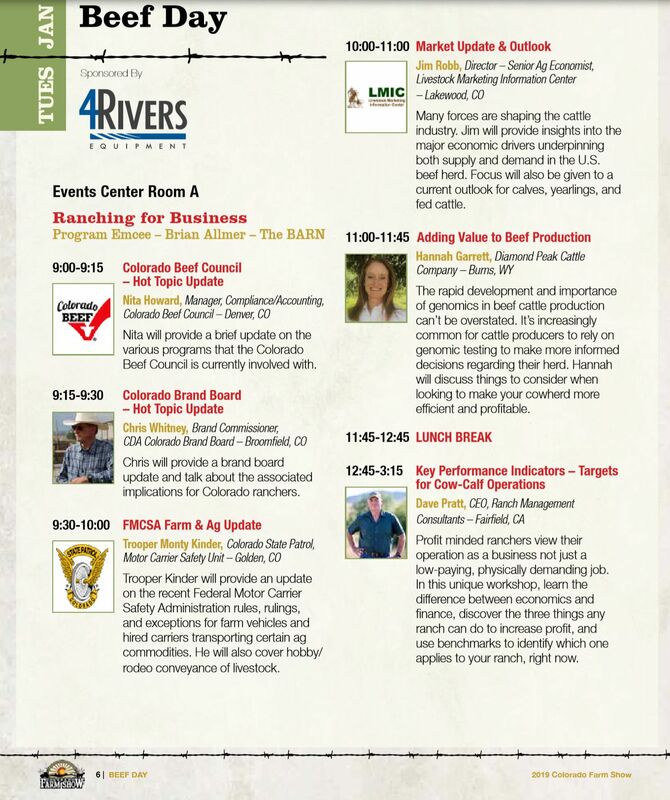 Make plans to attend BEEF DAY @ the 2019 CO Farm Show and learn more about Ranching for Profit on Jan 29th! BRIGGSDALE, CO – December 26, 2018 – Are you interested in finding breakthroughs that will improve your herd’s health and productivity on your ranch as well as increase the profitability of your business and improve the quality of your life all at the same time? Ag commodity and policy groups across the board are pleased the 2018 Farm Bill is over the finish line. The National Corn Growers Association says it’s pleased farmers can look forward to 2019 with the certainty of a new farm bill in place. An NCGA statement says, “Between depressed commodity prices, record low farm incomes, as well as tariff and trade uncertainty, this is welcome news.” The American Soybean Association is happy with provisions in the bill that maintain the ARC and PLC programs, as well as a strong crop insurance program, funding for Foreign Market Development program, and many of its other priorities. Incoming House Ag Chair Collin Peterson says the new bill provides expanded, affordable risk management options for dairy farmers, as well as permanent, mandatory funding for a host of other valuable programs. The National Cotton Councill says the legislation means the continuation and enhancements of a much-needed safety net, crucial for many producers still dealing with the aftermath of natural disasters in 2018. The U.S. Meat Export Federation says one of the most critical components in the new bill is support for the international promotion of U.S. agricultural products. The American Farm Bureau says the bill improves on risk management programs, invests in research and beginning farmer programs, is budget neutral, and ensures environmental stewardship programs continue to be available. A coalition of food and agriculture groups insist that any future trade agreement between the U.S. and the European Union include agriculture. The groups also want the agreement to address the EU’s restrictive tariff and non-tariff barriers to U.S. farm products. Those 53 organizations sent a letter to the Office of U.S. Trade Representative Robert Lighthizer. They want the administration to continue stressing to the EU that only a truly comprehensive agreement will be acceptable to the administration and the U.S. Congress. The EU has openly expressed reluctance to include agriculture in any future trade agreement with the U.S. An agreement would require the EU to lift import barriers that protect their farmers and remove regulatory measures that are scientifically unjustified or overly restrictive. Because of those barriers, the U.S. had a trade deficit at nearly $11 billion last year, and it’s only increased over the years. The trade deficit with the EU was $1.8 billion back in 2000. Ag Secretary Sonny Perdue took a look back at a busy year for the USDA and said his agency accomplished a lot of good things for American agriculture. “We fought for American farmers, ranchers, and producers by delivering new and improved trade deals like USMCA and a re-negotiated KORUS agreement, provided trade assistance to farmers because of illegal trade retaliation, and helped our fellow citizens through devastating natural disasters,” Perdue says. “I’m proud to say that every day at USDA we do our best to live by our motto to ‘Do Right and Feed Everyone.’” He says accomplishments include making strides toward reigning in dependence on government assistance by beginning the rule-making process to move more able-bodied adults without dependents off the SNAP program and to self-reliance. USDA also provided a broad range of assistance to residents, agricultural producers, and impacted communities at large following Hurricanes Florence and Michael in 2018. Over the past year, the USDA Forest Service treated more than 3.5 million acres to reduce hazardous fuels and improve forest health through timber sales and prescribed fire. The agency also successfully merged the Agricultural Marketing Service, Grain Inspection, Packers and Stockyards Administration, and the Farm Service Agency’s Commodity Operations programs to better meet the needs of farmers, ranchers, producers, and consumers, while also improving customer service and maximizing efficiencies. Ag Secretary Sonny Perdue says the USDA has developed a set of criteria to evaluate the 136 expressions of interest received from groups in 35 states. Those locations are all possible new homes for the National Institute of Food and Agriculture and the Economic Research Service. “We don’t undertake these relocations lightly,” Perdue says.”We’re doing it to improve the performance and services these agencies provide. We’ll be placing those agencies closer to many stakeholders, most of whom live and work far from Washington, D.C.” He says the move will save money for taxpayers and improve the USDA’s ability to retain more employees in the long run. They’ll also increase the probability of attracting highly-qualified staff with training and interests in agriculture. UDA will apply a set of guiding principles, including locations meeting USDA travel requirements, locations with specific labor force statistics, and locations with work hours most compatible with USDA office schedules. Genetically modified cannabis might turn into a lucrative cash crop someday. Already, scientists are racing each other to sequence the cannabis genome. That would enable producers to highlight desired traits, make the plants less dependent on pesticides, or possibly develop new medical treatment options for cannabis. There aren’t many regulations guiding the budding business sector. That makes things uncertain for both growers and consumers. Modified marijuana is still in the research and development stage, but the products could jump from labs to farms within only a few years. Politico says there is no framework in place for studying the safety risks of biotech cannabis for humans and other plants. Cannabis is still illegal at the federal level, so USDA and FDA can’t regulate the product like they can for other genetically engineered plants. Large agribusiness companies like Bayer and Syngenta aren’t active in the emerging business space yet, leaving startups to dominate the field so far.